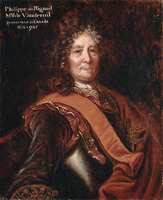 LE MARCHAND DE LIGNERY, CONSTANT, esquire, lieutenant and midshipman in France, lieutenant and captain in Canada, knight of the order of Saint-Louis, twice commandant at Michilimackinac, town major of Trois-Rivières; b. c. 1663 at Charentilly, near Tours; d. 19 Feb. 1731 at Trois-Rivières. He was the son of Joseph Le Marchand de Lignery, esquire and Marguerite Du Sillar. 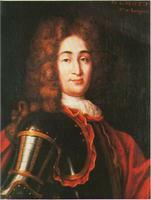 He began his military career as a lieutenant in the Régiment d’Auvergne in 1675. In 1683 he transferred to the navy and served as a midshipman in the port of Rochefort. Four years later he came to Canada as a half-pay lieutenant. Lignery did not play a prominent part in the Iroquois war, but he did make a favourable impression on his superiors for he is frequently referred to as a “good officer” in the colony’s military rolls. He was promoted to the rank of lieutenant in 1688 and to that of captain in 1705. 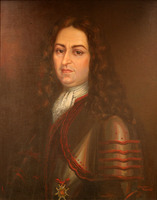 Five years later, Philippe de Rigaud de Vaudreuil planned to send Louvigny [LA Porte] and Lignery together to reoccupy the strategic post of Michilimackinac, abandoned by royal orders since 1696. Lignery at first was to serve in a subordinate capacity, but the governor expected him to become fully conversant with the affairs of the post and qualified to take command there in a year or two. In 1712, when war with the Fox Indians broke out and Louvigny found himself unable to leave for the west, Vaudreuil decided to send Lignery at the head of a small party to take possession of the post. 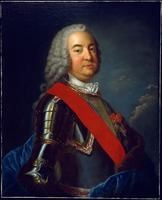 In 1715 Lignery was chosen by Claude de Ramezay, acting governor of New France, to command a major expedition against the Foxes. Ramezay instructed him to assemble the coureurs de bois and northern Indians and to lead them to the Chicago portage. There they would join forces with a second corps, recruited among the native tribes of the southern Great Lakes, and together move against the enemy. Unfortunately, a series of mishaps prevented the execution of this project. The southern contingent failed to assemble as planned and Lignery himself never left Michilimackinac with his army. The supply convoy he was expecting from Montreal did not arrive on time, and he was unable to control the unruly French volunteers, most of whom preferred trading with the Indians to making preparations for war. Although a disappointed Ramezay criticized Lignery for his actions at Michilimackinac, the primary cause of the campaign’s failure was not faulty leadership but bad planning and lack of discipline in the army, which because of the court’s refusal to subsidize the venture had to be made up entirely of Indians and coureurs de bois. In 1722, shortly after having been awarded the cross of the order of Saint-Louis, Lignery returned to command at Michilimackinac after an absence of approximately three years. The Foxes had just resumed their war against the French and their allies and were delivering their most destructive blows against the white and native populations of the Illinois country, which formed part of Louisiana. Lignery appears to have been unmoved by the plight of the sister colony, for he adopted a policy of conciliation towards the Foxes that was primarily designed to preserve peace in Canada’s part of the west. Such conduct reflected Vaudreuil’s desire to spare Canada the calamity of another Indian war and perhaps also Lignery’s fear that such a conflict would disrupt the fur trade, in which he was now actively engaged. In 1724, Lignery negotiated the notorious treaty by virtue of which the Foxes ended their war on the Chippewas but continued the one they were waging on the Illinois Indians. Although he claimed that he had done his best to include the latter in the settlement, the officials in Louisiana and Versailles felt, perhaps with some justification, that Vaudreuil and Lignery had sacrificed the southern colony to the Foxes to prevent it from sharing in the western fur trade. 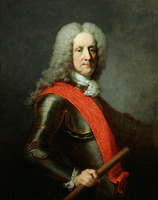 In 1726, Lignery was sent back to Baie des Puants (Green Bay) by Charles Le Moyne de Longueuil, acting governor of Canada, to renegotiate the treaty. This time, the commandant of Michilimackinac reported that he had obtained from the Foxes the promise that they would remain at peace with all the French allies. Late in 1726 a new governor, Charles de Beauharnois* de La Boische, arrived in Canada apparently determined to begin his administration with a resounding military victory that would establish his reputation among all the Indian tribes. In 1728 he sent against the Foxes an army of 450 French and over 1,000 Indians under the command of Lignery. This force, the largest ever to advance so far into the interior, failed to come to grips with the elusive enemy. The latter fled westward, and the French and their allies had to be satisfied with burning their villages and ruining their crops. Beauharnois blamed Lignery for the army’s failure to engage the Foxes in battle and made such serious accusations against him in his report to the ministry that Maurepas decided to have him tried by a council of war. Lignery stood accused of having mismanaged the supplies and of having marched his men at such a leisurely pace that the Foxes had been given ample time to make good their escape; of having refused, in spite of a disabling illness from which he was suffering, to allow Beaujeu [Liénard*], his first lieutenant, to assume command of operations in enemy territory; of having abandoned large quantities of merchandise at Michilimackinac on the return trip to Canada to make room, it was suggested, for beaver pelts. After hearing several witnesses and reviewing all the evidence, the council of war unanimously dismissed these charges as unfounded and acquitted Lignery, but the ordeal had apparently been too much for the old officer. He died a few months later in Trois-Rivières where he had been named town major in 1728. In Montreal, on 10 Nov. 1691, he had married Anne Robutel de La Noue, daughter of the seigneur of Île Saint-Paul. Seven sons and two daughters were born of their marriage. The best known of these was François-Marie*, captain in the colonial regular troops and knight of the order of Saint-Louis, who was fatally wounded by the English during an engagement near Fort Niagara in the summer of 1759. AJM, Greffe de Bénigne Basset, 17 nov. 1691 (Lignery’s marriage contract). AN, Col., B, 33, 34, 35, 36, 37, 44, 45, 47, 48, 50, 52, 53, 54; C11A, 22, 31, 34, 35, 44, 46, 47, 48, 49, 51, 56; D2C, 47, 49, 222; E, 125 (dossier de Lignery); F³, 9. Emmanuel Crespel, Travels in North America (London, 1797). 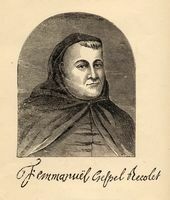 Father Crespel*, a Recollet friar, accompanied the expedition of 1728 against the Foxes as chaplain; his book contains an account of this campaign. The most important documents relating to Lignery’s career in the west are printed in Wis. State Hist. Soc. Coll., XVI, XVII. Massicotte, “Répertoire des engagements pour l’Ouest.” P.-G. Roy, Les officiers d’état-major, 162–66. Kellogg, French régime. P.-G. Roy, “A propos des Le Marchand de Lignery on Ligneris,” BRH, XLIX (1943), 300–3. Yves F. Zoltvany, “LE MARCHAND DE LIGNERY, CONSTANT,” in Dictionary of Canadian Biography, vol. 2, University of Toronto/Université Laval, 2003–, accessed April 24, 2019, http://www.biographi.ca/en/bio/le_marchand_de_lignery_constant_2E.html.